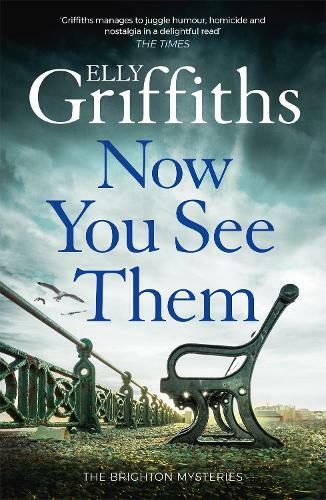 The fifth gripping Brighton-based mystery from the bestselling author of the Dr Ruth Galloway series - a must-read for fans of Agatha Christie, cosy crime and TV series such as Grantchester and Midsomer Murders. One after another, young women go missing in Brighton, but who's to say they didn't leave of their own free choice? Ten years have passed since the events described in The Vanishing Box. Edgar Stephens is now a Superintendent and married to former DS Emma Holmes. Edgar's wartime partner in arms, magician Max Mephisto, is a movie star in Hollywood, while his daughter Ruby has her own TV show, Ruby Magic. The funeral of Stan Parks, aka Diablo, actor and wartime comrade to Edgar and Max, throws the gang back together. The reunion sparks all sorts of feelings. Bob Willis, now a DI, is dealing with the disappearance of local schoolgirl Rhonda Miles. Emma, frustrated by living the life of a housewife and mother, keeps thinking how much better she would run the case. She is helped by Sam Collins, a woman reporter also hampered by sexism at work. Sam notices a pattern with other missing girls. Edgar listens to the theory but doesn't give it much credence. He is preoccupied with the threatened invasion of Brighton by Mods and Rockers on the May Bank Holiday. The case takes a more sinister turn when one of the missing girls is found dead. Then Ruby fails to turn up for a rendezvous and it becomes clear that she too has disappeared. Emma takes risks to track down the killer herself while Edgar is working flat out dealing with violent clashes between rival gangs on Brighton's seafront. With tension and anger hitting him on all sides, Edgar must keep the coolest of heads to track down the killer. Elly Griffiths is the pen-name of British author Domenica de Rosa. A former Editorial Director for children’s books at Harper Collins, Griffiths published her first novel, The Italian Quarter, in 1998 under her own name. A holiday in Norfolk inspired her to write what would become the bestselling novel The Crossing Places, the first novel in the Dr Ruth Galloway series of mystery novels and Rosa’s first novel as Elly Griffiths. She is also the author of the popular Stephens and Mephisto novels which began with The Zig Zag Girl.